Kavanaugh Pens Op-Ed: Maybe I Was Too Emotional - Joe.My.God. I testified before the Judiciary Committee last Thursday to defend my family, my good name and my lifetime of public service. My hearing testimony was forceful and passionate. That is because I forcefully and passionately denied the allegation against me. At times, my testimony—both in my opening statement and in response to questions—reflected my overwhelming frustration at being wrongly accused, without corroboration, of horrible conduct completely contrary to my record and character. My statement and answers also reflected my deep distress at the unfairness of how this allegation has been handled. Going forward, you can count on me to be the same kind of judge and person I have been for my entire 28-year legal career: hardworking, even-keeled, open-minded, independent and dedicated to the Constitution and the public good. As a judge, I have always treated colleagues and litigants with the utmost respect. I have been known for my courtesy on and off the bench. I have not changed. No paywall at the above link. Judge Kavanaugh’s stunning decision to pen an op-ed bluntly confirms he has neither the judgment nor the temperament to be on our highest court. He can’t erase blaming credible sexual assault allegations ‘on the Clintons,’ attacks on senators, and vows of revenge with an op-ed. Kavanaugh chose two Murdoch-owned outlets to make his case: Fox News for his TV interview and WSJ for his op-ed. 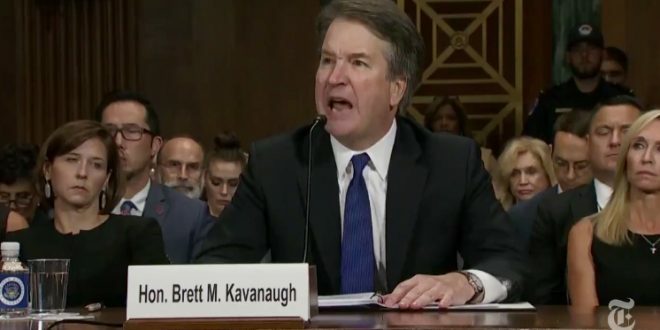 Trust me, how I behaved during that testimony is not who I am, and I would not be that way on the Supreme Court.